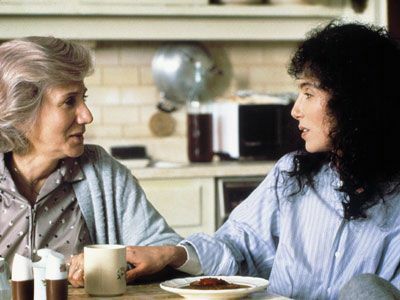 Moonstruck introduces Cher’s Loretta, a Brooklyn widow approaching middle age who rather neutrally accepts a proposal from her fumbling gentleman caller Johnny. As she casually tells her mother, she doesn’t love him, which gives her the freedom of Johnny never having the capability to truly drive her crazy. Loretta is perfectly content with an impending simple life with Johnny until he leaves to be with his dying mother and sends Loretta to reach out to his estranged brother Ronny. Played by Nicolas Cage when he was only 23, disabled Robby is bitter about life, but when he makes a connection with Loretta, the two realize that this new bond could cause them more trouble than they bargained for. I have to say, the romance between Loretta and Ronny was the one part of this movie that I just didn’t get. I didn’t understand why they were drawn to sleep with each other when they first met, and I didn’t see Ronny’s appeal. Was this like an Of Mice and Men situation? Was Ronny the slow and gentle type who wasn’t totally with it? Based on older women’s reactions to the film after originally watching it as teenagers (author Jill Mansell, for example), it seems that the characters’ relationship is one of those situations where you find something so overwhelmingly romantic as a teen and then, as an adult, you realize that the scenario is kind of messed up. Other than not digging the questionable romance, I genuinely loved the rest of Moonstruck. Something about Brooklyn before the millennial, hipster craze really captivated me, and I’m a sucker for Italian crooners’ music, which features prominently throughout the film. The concept is so simple and typical, and perhaps it’s because I’m so familiar with the ways these characters interacted, but there was something endearing about how realistic the film’s tone was. In my grandparents, there was and is a quality I now recognize as brutal yet witty realism. These people who watched their parents acclimate to the crowded, ever-changing boroughs in a new country had to develop these joint identities, learn what it meant to be Italian-Americans and Irish-Americans. I’ve watched them truck on in adversity and find ways to joke in gray times. I saw this critical awareness of their situations in the older characters of Moonstruck, which I think is a key element of that generation’s characterization. Although he’s supposed to be this helpless, often sleazy womanizer who intentionally targets his young student, I really loved the characterization of Mahoney’s Perry. As a viewer, you understand why people are so easily charmed by him, but you can’t help but wish that he just wise up and find something appropriate to date. That being said, I have a bit of weakness for academic men, so perhaps this is why I’m sympathetic toward Perry. Let’s see if my reaction to him in 20 years matches that of the women who loved Ronny during their first watch.